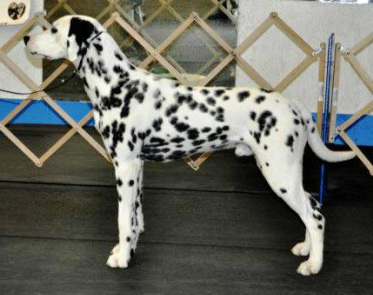 Maks is one of a handful of very special normal uric acid Dalmatians. What makes Maks extra special is that he is homozygous (has 2 copies) of the gene for normal levels of uric acid. This makes Maks just what we ordered for Pekoe. While no pup will ever be perfect (even though we all think our dogs are all perfect! ), these pups will never have to worry about urate stones - a potential problem for most Dalmatians. We expect pups with outstanding temperaments, working ability.